Students used a range of innovative problem-solving techniques at the final of educational charity SATRO's 'Problem Solving Challenge 2016', which was supported by Frazer-Nash. Frazer-Nash has been helping to fund the Problem Solving Challenge for four years, which sees schools across the South East develop their creative, team working and time management skills as they devise solutions to problems. At the final, held on Thursday 17 March at the ACS Cobham International School, 30 teams aged between 11 and 19 competed in three age groups to win the prestigious challenge event. Each team was given a folder of materials and 90 minutes to build a ski lift that could transport as many POLO mints as possible. The 30 teams won their place in the final out of 156 teams who entered, through success at the regional heats in February. At the heats, students had to design and build a quiz timer that could measure two separate time periods of ten and 20 seconds. Frazer-Nash engineer, Douglas White attended the final and praised the ingenuity that the participants had shown. He said: "It was great to see the students using their science, technology and maths learning to apply to the kinds of problems that engineers deal with every day - albeit ours are on a somewhat larger scale. "Using their design and planning skills, then reviewing, testing and modifying their creations, they were able to work together to solve the problems and meet the challenge. 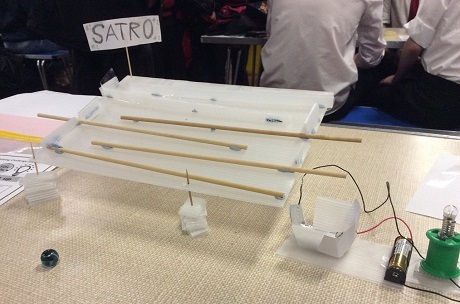 I have no doubt that many of the engineers of the future are being encouraged by the work that SATRO does." Many Frazer-Nash staff volunteer for STEM activities, supporting schools and youngsters across the UK and helping to develop the next generation of scientists and engineers. SATRO is an educational charity and social enterprise which has been working with young people in Surrey and the South East since 1984. SATRO provides real-life experience of all aspects of the working world, particularly in Science, Technology, Engineering and Maths (STEM,) through a diverse and challenging range of programmes. It works closely with schools, businesses and volunteers to inspire young people, fuelling their passion and enthusiasm for their future careers. Find out more about SATRO's work at http://www.satro.org.uk/.